This recipe is as classy and impressive as the Prime Rib and Rack of Lamb, yet as easy as any weekday dinner. So if you’re looking to impress there’s not much that can compare to a beautifully cooked, whole Cornish Game Hen showcased on a plate. You can also serve just half if you have plenty of sides and a larger group to feed. This is a recipe I wrote for Primo Grills last year. We enjoyed it right alongside my Prime Rib at Christmastime. When I came up with this recipe I was looking for a great way to show that you don’t have to chop up or butterfly birds to get them to cook evenly - especially not these little birds. And the kicker here is the flavor. These little birds have a wonderful, yet delicate flavor that will rival any bird. What are Cornish game hens? Cornish game hens go by a few different names: Cornish hen, Poussin or Rock Cornish hen. It’s not really a game bird, but a cross between the Cornish Game and Plymouth/White Rock chicken breeds. They’re a choice breed for their shortened raising period and their succulent flavor. They're harvested earlier and weigh less than 2 pounds (typically around 22 ounces). This small size makes them a prime candidate for a single-serving bird. And Frank Costanza was right – it really is “a little chicken”! You may ask I use a dutch oven for this recipe. Well, these birds are a little more delicate and have very little fat so they benefit from basting. Basting is a way to add moisture and enhance the flavor at the same time. With our Smoked Thanksgiving Turkey we did this with a brine. With the Cornish Game Hen we’re keeping it simple. I also thought this recipe would be a great way to show you it isn’t always necessary to spatchcock, butterfly or beer-can a bird to keep it moist (although I enjoy the first 2 methods too). If the game hens are frozen, be aware that they will take at 24-36 hours to thaw. 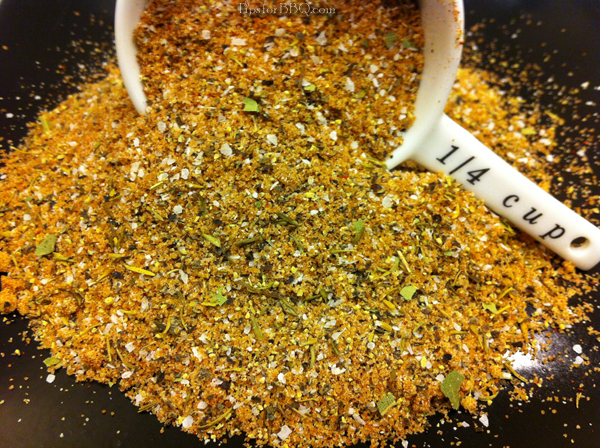 The Bye Bye Birdie Rub can also be prepared ahead of time and stored in an air-tight jar. Prepare your grill for smoke-roasting, using direct heat, at a temperature of 325°F. I normally cook this on my Primo Grill. I set up the grates at the standard or rim-level height and cook directly over the charcoal. For this recipe I use a turkey baster and stove-top Dutch oven without the lid. This allows for the grill to impart a slight flavor from your choice of fruit wood and it is also easily transported. I use a stove-top Dutch oven so they legs don’t get in the way. Another good option for long cooks such as this is a quality enameled cast iron oven like a Le Creuset or Cuisinart . There are cheaper versions out there, but I wouldn’t recommend them. Alternatively use any container that can handle the weight, but be careful when transporting the hot, liquid-filled container. 1) Using a large 10-12” Dutch oven fill the bottom with the potatoes, carrots and mushrooms. The vegetables should be coarsely chopped into bit-sized pieces. Add 4 cloves of crushed garlic. Pour the olive oil, white cooking wine and chicken broth into the Dutch oven. This will lightly coat the vegetables and provide liquid for basting later during the cooking process. 2)	Gently rinse and dry each game hen. Quarter the lemon and place a slice in each bird along with a 2-3” sprig of rosemary. Generously apply a couple of teaspoons of the rub to each bird. There will be more than enough for all four. Place the birds breast-side up on top of the vegetables. 3)	When the temperature has reached 325°F, place the Dutch oven on top of your grill rack. Cook for 20-30 minutes then start basting the game hens every 15 minutes. Simply squeeze the turkey baster and fill it up with the pan juices from the bottom of the Dutch oven. Do this several times gently basting each game hen. Cook the game hens for approximately 60-90 minutes until each bird reaches 165°F in the thickest part of the meat. They can be rotated once if needed. Remove the game hens from the Dutch oven and allow to rest for 5 minutes. 4) The remaining liquids and vegetables can be served as a savory gravy. If needed, it can be gently boiled for a few minutes to thicken. The Cornish game hens can either be served half or whole.